Careful selection of the food you eat is one of the fastest and easiest ways to be more eco-friendly. After all, food is the second highest category in the average US households carbon footprint, second only to automobiles. Nearly half of the food carbon footprint is because of the consumption of red meat and dairy. See our article for the details. Even though I love a great burger, I’m always looking for opportunities to reduce red meat consumption, especially if it’s without sacrificing the flavor. Vegetable lasagna for meat lovers hits the mark. Our vegetable lasagna recipe combines the healthy benefits of all fresh vegetables, even in the tomato sauce, with the texture and taste of a mild Italian sausage meat sauce. The trick is using non-meat sausage patties instead of the usual pork based sausage. While I’m not a huge fan of veggie meat substitutes, I’ve found that the MorningStar Farms® Veggie Sausage Patties work really well in this easy lasagna recipe. The ultimate in eco-friendly and healthy food is using locally or even home grown ingredients. This is practical for only part of the year. For the off-season it’s fairly easy to can or freeze the tomato sauce. That way you can avoid the transportation of heavy jars of canned sauce, which believe it or not, creates considerable air pollution. See our article on transporting canned foods for more information on this issue. Our Fresh Tomato Sauce recipe is a great source for antioxidants and nutrients. See the recipe for all of the nutritional information. In addition, we add three vegetables with excellent health benefits. World’s Healthiest Foods summarized the impressive health benefits of spinach. “We all know that Popeye made himself super strong by eating spinach, but you may be surprised to learn that he may also have been protecting himself against osteoporosis, heart disease, colon cancer, arthritis, and other diseases at the same time.” Spinach is an excellent source of vitamins A, B2, B6, C and K as well as manganese, folate, magnesium, iron and calcium, potassium. Vegetables are low carbon producing foods. This homemade recipe saves 2 to 4 glass jars and/or steel cans from recycle bins or the landfill. No transporting of heavy jars or cans of sauce and ingredients saves air pollution. Fresh ingredients (tomatoes, garlic, onions, peppers, celery, carrots, parsley, basil, mushrooms, spinach, and zucchini) provide very high nutritional value. Fresh homemade sauces avoid toxic BPA lined tomato cans. Elimination of the pork sausage saves fat calories and cholesterol. Warm the tomato sauce in your saucepan over medium heat. Place the frozen vegetarian sausage patties on top of the sauce to thaw for a few minutes. Then shred the patties into the sauce with a fork, to a consistency of ground hamburger. Ladle about 1¼ cups of sauce into the lasagna pan and spread to form a thin layer. Add a layer of lasagna noodles, then spinach leaves, mushroom slices and zucchini slices. Sprinkle a third of the shredded mozzarella on top of the vegetables. Next place in marble sized spoonfuls of ricotta, spaced every 2 inches or so. Sprinkle a third of the shredded parmesan on top of the ricotta and cover with a layer of half of the provolone slices. Repeat for a second “mega” layer with sauce, noodles, veggies & cheeses. Finish with another layer of sauce and lasagna noodles. Push down the noodles with your fingertips to remove air pockets from between layers, and cover the noodles with a final layer of sauce. Reserve the remaining mozzarella cheese, parmesan cheese and last cup of sauce for serving. Cover the pan with aluminum foil being careful not to have the foil touching the tomato sauce (acidic tomato sauce reacts with aluminum giving the tomatoes a bitter taste and faded color). Bake the lasagna in a preheated 375° oven for 45 minutes. Remove the pan from the oven, uncover and sprinkle the remaining mozzarella and parmesan cheese on the top. 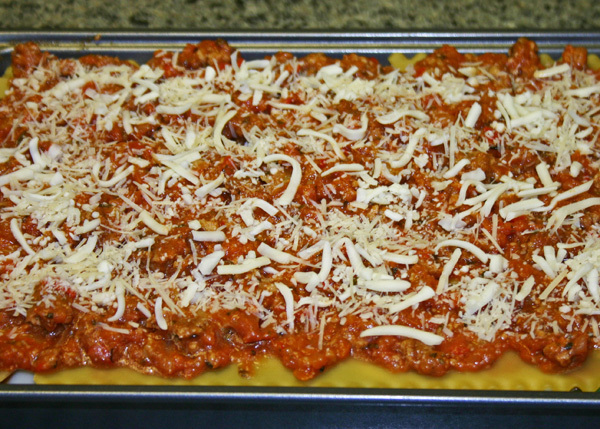 Let rest for at least 15 minutes to allow the lasagna to cool and firm up, before serving. Cut into squares or rectangles and serve with a large spoonful of warmed tomato sauce on top. Refrigerate the leftovers. It taste even better the next day!